If you don’t already have your dance attire, letting your dancer help select their outfit for class can be a great way to help build some excitement and ownership. Our Children’s Division dress code allows for any color leotard as well as skirts and tutus, so picking a favorite color or special skirt can be motivating. You can also talk to your child about how dancers wear their hair in a special way, allowing little ones to get used to the idea of a ponytail, braid, bun, headband, or other lovely way of keeping their hair out of their face during class. Pack up the ballet bag the night before so there’s no scrambling for lost items as you’re trying to head out the door. We actually recommend hiding that packed ballet bag until right before you’re ready to leave—we can’t count the number of times a family has shown up to the studio on the first day only to discover that their super-excited little dancer had been dancing in their ballet shoes before they left home, and the shoes never made it back into the bag! However, if you do misplace something and it’s time for class, don’t worry—we have a “borrow box” of shoes and dance wear here at the studio for those situations. Just let your teacher know when you arrive that you need to use the “borrow box”! Time your arrival right! While early is good, too much time in our waiting room just sitting with mom or dad can lead to anticipation anxiety. We have found 5-10 minutes ahead of class time is the perfect amount of time to take care of potty business and shoe changing before bouncing happily into class. On the other hand, feeling rushed and sensing a stressed out parent is tough on a child’s confidence, so make sure you leave enough time for a relaxed arrival. We are on the lower level of Hilldale right below Metcalfe’s Supermarket, so you’ll need to allow a little extra time to park, walk through Metcalfe’s, and choose the stairs or the elevator (guess which is the more popular choice?) to head downstairs. Keep your pre-class conversation positive, but try not to build up super high expectations (we do have lots of fun…but it’s not quite the same as Disney World!) Asking your child questions like “I wonder if you will do some jumping?” or, “what do you think the story will be about?” works better as pre-class conversation than just telling them how great it will be. Occasionally, overselling leads to worries in sensitive kids—”gosh, Mom is working really hard to tell me this is going to be great. Maybe she’s worried it won’t be?” Keeping things light and matter-of-fact typically helps kids feel confident and ready to participate like it’s no big deal. 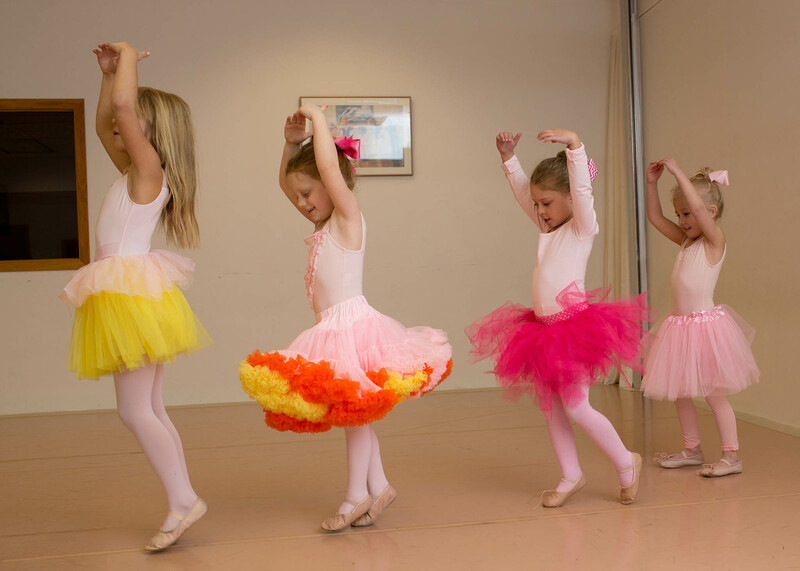 If your child is hesitant to come into ballet class, we will help! We have lots of experience getting first timers to feel comfortable with their brand new experience of being without their parent in a class. We’ll help as much as we can and will communicate with you to make the best plan for your child. Every child is different—some need a little time to quietly observe and take everything in before they participate, some need the distraction of immediate involvement, and some need the reassurance that mom or dad is just outside the window watching. We love your insight into what might help your child, and we will do our best to guide them smoothly into class. Once the class is complete, a few specific questions like “what was your favorite part?” or “did you like galloping or tiptoeing the best?” are better at reinforcing to your dancer that they really enjoyed the class than a more general question like “did you have fun?” If they remember that one specific thing that they really liked, they’re more likely to be excited for the next class! Mrs. Mast, Ms. Maelanie, Ms. Seyenna, Ms. Alaina, Ms. Eva, Ms. Ally, Ms. Crystal, Ms. Kathleen, and Ms. Alexis are all ready to help you and your child with anything you need to make this first ballet class a positive one. Thanks so much for your trust in us…we look forward to working with you and your child!